In September of 1996, Mary Romeo was out for a stroll along a "duck pond" on the Kent Campus of Florida State College Jacksonville when she discovered a dead Pomacea paludosa along the shoreline. She turned this specimen over to her shell collecting physician (Dr. Harry G. Lee of Jacksonville) who added the specimen to his collection and duly recorded the locality data. Despite this "duck pond" (in actuality a shallow lake of about 1 1/2 acres) being quite conveniently located on a college campus, in a residential neighborhood, in proximity of a six-lane highway, this lake was apparently not further investigated by any local shell enthusiasts until my recent visit on June 12, 2005 - nearly nine years later. 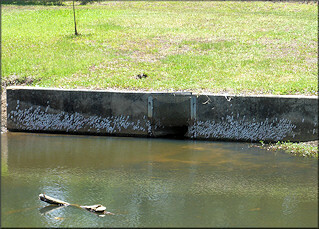 The June, 2005 visit revealed that the "duck pond" was literally overrun with live Pomacea and the lake bottom was alive with crawling specimens of all sizes including many mating aggregations (one male one female & multiple males one female assemblages). To add to the overall molluscan circus atmosphere, the sandy lake bottom was covered with Utterbackia imbecillis (Say, 1829) [Paper Pondshell] - both dead and alive - while the lake edge teemed with large Planorbella duryi (Wetherby, 1879) [Seminole Rams-horn]. 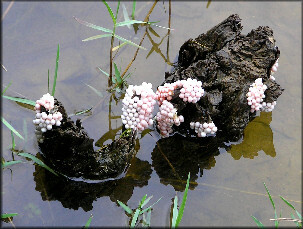 The large population of Pomacea was somewhat surprising in that the lake was nearly devoid of suitable structure needed for the species to deposit their egg clusters in order to propagate. But propagate they surely did employing what modest structure they had to work with including trees, roots, and concrete culverts. However, the real mystery in regards to the "duck pond" is not how the Pomacea managed to survive, but how they came to live in this man made impoundment, not connected to any other, in the first place. It is suspected that many freshwater species are transported from one location to another by birds. This is borne out by the similar molluscan fauna found in man made freshwater lakes in Duval County. 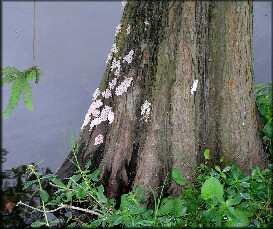 Following an unusually large amount of precipitation during late June/early July of 2005, during which the water level in the pond rose approximately eight feet above the normal level, there was a massive die-off of all aquatic species. This was discovered during a visit on July 7, 2005. During a follow-up visit on October 16, 2005, only a single live Pomacea could be found. During an additional visit on March 14, 2006 no living Pomacea were seen and thus they were believed to have been extirpated. However, during an additional follow-up visit on October 14, 2006, a single live Pomacea as well as a few new egg clutches were found suggesting that the species will ultimately be able to repopulate the pond. A visit to the pond on October 16, 2007 confirmed that a viable breeding population is still present in the pond as a relatively modest number of Pomacea egg clutches were seen. A follow-up visit was made to the pond on April 20, 2008 and a large number of fresh egg clutches were seen as well as a pair of adult Pomacea - thus confirming that the Pomacea population continues to rebound following near extirpation almost three years earlier. On April 4, 2009, a brief follow-up visit was made to the pond and a number of large live Pomacea were observed (including mating pairs) as well as freshly deposited egg clutches around the lake periphery. 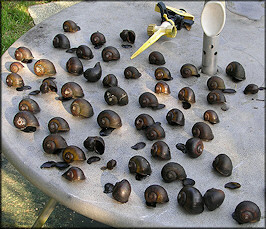 Nearly four years after being almost extirpated, it appears that the snails are well their way to repopulating the pond to the level initially observed during the summer of 2005. 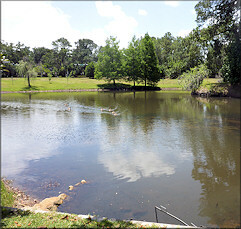 View Of The "Duck Pond"